In formal Israelite legal documents, there were two parts, as documented by Jeremiah: one part that was sealed, and one part that was open (see Jeremiah 32:10–14). Seals were placed on the closed portion, and witnesses signed the end of the document, attesting to its authenticity. Finally, the sealed doubled documents were placed in containers and preserved. The pictures at the bottom of this chart show the process by which ancient manuscripts containing one closed part and one open part were folded and sealed. 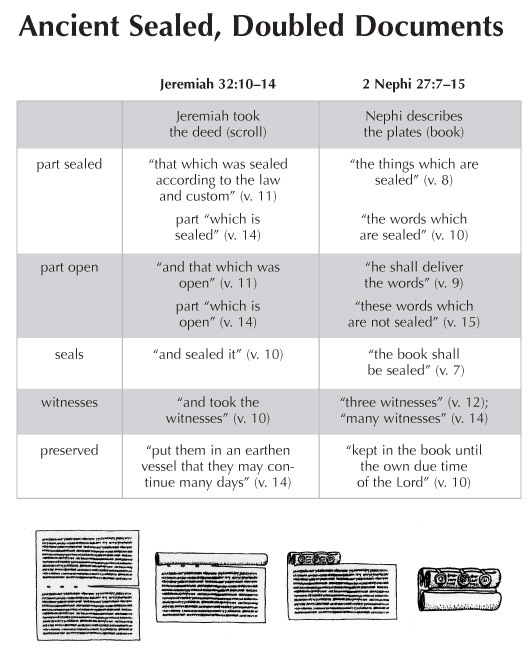 The Book of Mormon, as 2 Nephi 27:7–15 indicates, followed this ancient process of sealing and authenticating a text. The plates of Nephi had two parts: one open and one closed. Seals kept the closed part secure, and as promised anciently, witnesses were provided who signed the Book of Mormon after it was translated. Interestingly enough, the testimonies of the Three and Eight Witnesses were originally placed at the back of the Book of Mormon, at the end of the document, just as ancient Hebrew law would have required. The plates were preserved in a stone container until the Lord directed Joseph Smith to translate them.